Recommended to: Girls who love reading about girlish topics! Difficulty Level: Just before the Middle Grade mark. A chapter book, but with less words per page and more explanations. Kylie Jean wants to dance the main role in Swan Lake. Kylie Jean: Dancing Queen is part of a larger series, all focusing on Kylie Jean's character. By my count there are now 8 books in the series, and they all look adorable! Based on this particular book, I can definitely say that this is a series that young girls will just eat up. Kylie Jean is spunky, she's sweet, and about as honest as a kid can get. Add in her insatiable need for learning new things, and you've got a little girl that other little girls will love. In this story Kylie Jean wants the main role in the ballet version of Swan Lake. The story follows her as she practices her heart out and then nervously tries out. Even when she doesn't get the part she was pining for, she shows young readers how to be proud of what you've accomplished anyway. She's a great role model. There are a lot of good lessons in the story, including how to be kind to others. 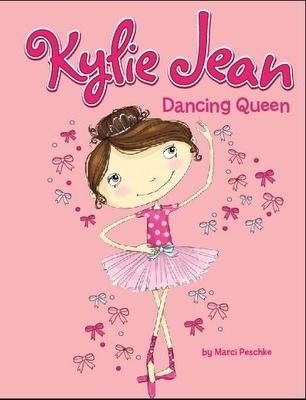 I definitely think this would a great addition to any little ballerina's book shelf. As I mentioned above, this book hits the mark right before Middle Grade. It's a chapter book, but the chapters are short, the words are moderately easy, and the illustrations help keep readers immersed. This would be prefect for 7-8 year olds who are ready for a chapter book!